With the very last of the FPB shop drawings nearing completion, we will bring you up to date in a number of areas over the next week. Let’s start with the Matrix deck. This is both a working area for watch keeping and close maneuvering, and a prime entertaining area. There is a combination of fixed and removable furniture for maximum flexibility. We are looking here from the starboard forward corner aft. 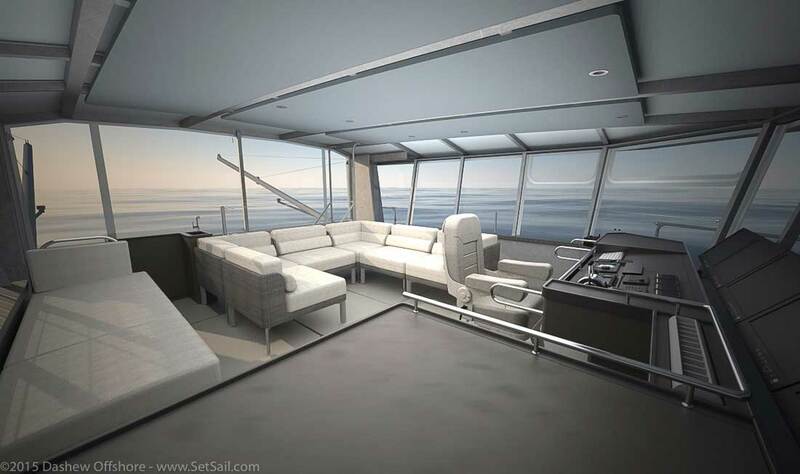 The Brown Jordan furniture shown amidships can be arranged in different ways. It is shown here in a seagoing mode, where it is secured to eyebolts in the deck. To starboard is a raised seat/watch bunk/storage box. 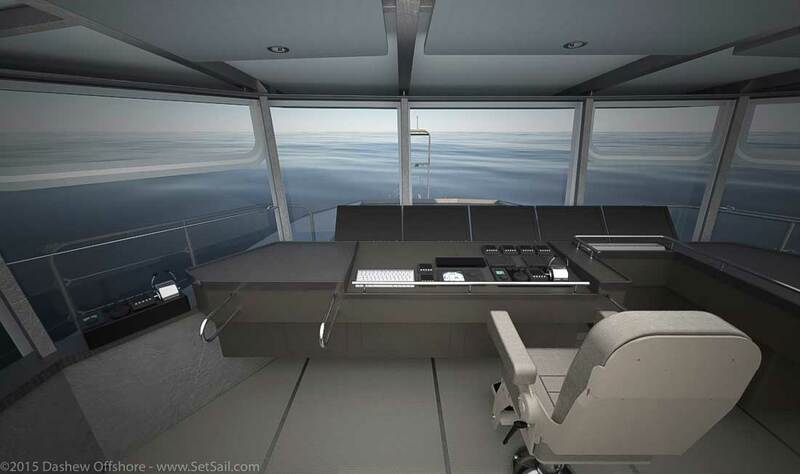 There is plenty of real estate for electronics, and chart table/storage area, to starboard. The stainless “trombone slides” are shown in their sea-going position. They slide forward, out of the way, in port. The second control box in the port corner is on a tether and is used for docking when you want to see alongside. In the aft starboard corner is a small bar with fridge and sink. There is also a head for use by the watch at sea. We will post more art and details in the next few days. This entry was posted on Friday, September 4th, 2015 at 9:23 am and is filed under Cruiser's Tech Talk. Both comments and pings are currently closed. Hi Steve: It looks as though there’s little room for a (dining) table? Also, are those monitors hinged? The Matrix monitors are indeed hinged. As to dining table, there are many options. For example, it would not require much effort to build and install a dining table, but then you might be better off with a folding table, which takes deck space only when it is needed. Brown Jordan is an excellent choice. We have 20+ year old outdoor furniture that still looks great–and we are in far South Texas near the Gulf so not the most benign environment. Their designs tend to be just as long lasting or “timeless” aesthetically as well–we have thought about replacing it several times and just never find anything we like better. Another advantage from having it up off the deck is eliminating storage in an area so high up in the boat. You had me at “Hello.” Wow. Stunning. I could just see myself conning and imagining those sight lines. Only a lotto win would allow an FPB78 for us, but should that ever happen, Todd will be getting a call. This boat is a lust object for sure. 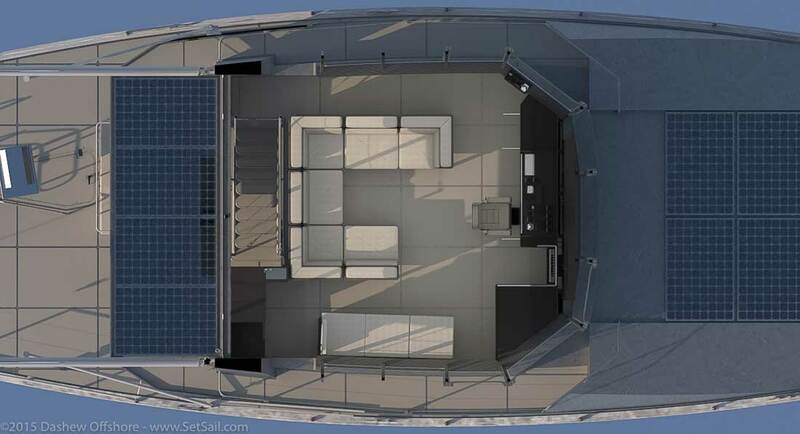 Question: where are the solar panel wiring runs? Solar panel runs come in via the matrx deck coamings, and then run through below via pre-welded pipe into the interior, which will be sealed. Looks like you’ve replaced the A frame with the stainless hoop like the 64s for easier access forward. Why the headliner? Aesthetics or to hide LED edge lighting? Just curious. The hoop forward is aluminum. Headliner panels under the Matrix deck roof serve several purposes. They give us somewhere to mount lights, they are part of a noise suppression program, and they will look very cool. Steve, what kind of material are the ceiling panels? What is the thinking behind adding these? Is the matrix deck heated/cooled? I noticed one outlet, but none along the front wind shield behind the monitors. Matrix deck is heated and there is an air conditioner. The latter is mainly for dehumidfying to keep the windowsclear in cold weather. Ceiling panels are wrappedin a special noise supression matrial. Lust is the correct term. I look at all that solar–I am hitting that age where the world suddenly looks like it is falling apart–and all that solar on a mobile platform that can go anywhere on the planet…and make its own water to boot! Hi Steve: I believe the bottom of the see-through panels is a fixed plastic panel, with the upper part some kind of fabric. Do both also protect against UV radiation? Separately, I think previous FPB models use a window film on the Great Room’s windows to keep out heat and UV, but at the expense of some light being blocked during night time, which upsets classification societies. Are there films or other UV-blocking solutions these days which still allow classification? Matrix windows block UV. The forward windows below are clear. 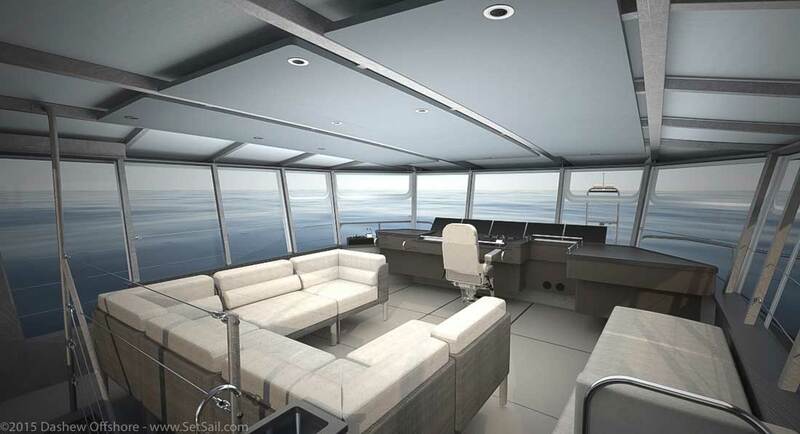 Side and aft windows have in the glass on FPB 78-1. The glass is low E, and has a thermal break within the laminate.